IMAGINE A nonviolent CITY WHERE EVERYONE strives to PRACTICE NONVIOLENCE, WHERE ALL THE INSTITUTIONS TEACH AND PROMOTE NONVIOLENCE, WHERE VIOLENCE NO LONGER RUNS RAMPANT. THIS IS OUR VISION. THIS IS OUR WORK. The Nonviolent Cities Project not only envisions cities that could become nonviolent, it is working to make this vision a reality across the US and the world. Campaign Nonviolence engages with key activists across the US to create more just and nonviolent cities. It all started with Carbondale, Illinois and their project, “Nonviolent Carbondale,” where people in every aspect of life in Carbondale have been working for years to create a more nonviolent community. When Pace e Bene’s John Dear visited the community, he saw how every aspect of the community worked to promote a nonviolent Carbondale, including the city council, police department, school system, library system, health care system, religious communities, and nonprofit organizations. He thought this was a model for the rest of the nation. We invite you to work with people in your local community to claim this vision as a way forward, to uphold this vision to make your city a “nonviolent city.” With “Nonviolent Carbondale” as a model, we invite you to call together activists and local leaders to launch this movement in your community, to put the word “nonviolent” in front of your city, and to help others envision, organize and work for a new, more disarmed, local community or city. Perhaps the greatest impact of Nonviolent Cities lies in each city working together to address violence in all its structures and systems. The Nonviolent Cities project mandates that cities pursue a more holistic, creative, city-wide vision of nonviolence, where everyone together practices, promotes, teaches and institutionalizes nonviolence at the local level. We seek not just to undermine the local and regional culture of violence, but to transform it into a culture of nonviolence. news reporters and local media. Together, we can address the issues of violence in your city and pursue the angles and possibilities of nonviolence for your city’s transformation into a more nonviolent community. As we start gathering in organizing meetings, and claim together the vision of nonviolent future for your city, more and more people will join the vision to welcome a new culture of nonviolence in your city. Let us know how we can help! in general, do everything possible to help their local community become more disarmed, more reconciled, more just, more welcoming, more inclusive, and more nonviolent. Though this is a broad, ambitious vision, we believe it is an idea whose time has come, a new step forward in the visionary nonviolence of Mahatma Gandhi and Rev. Martin Luther King, Jr.
See www.nonviolentcarbondale.org to learn how they have begun and continue their project. See the Ten Steps toward organizing your community as a Nonviolent City here. Together, we will take new, creative steps toward justice, disarmament and peace, and working for a new culture of nonviolence. LIST OF CITIES WORKING ON THE NONVIOLENT CITIES PROJECT. These cities are in various stages of organizing, some have launched and have held events and others are in the initial planning or exploration stages. If you are in one of the active communities listed below and want to get involved we encourage you to contact them. For others, email us for contact information. If your community is not listed, sign up at the bottom of the page to let us know that you’d like to start exploring this project. Tiffin, Ohio launches Nonviolent Tiffin with signs displayed throughout town. 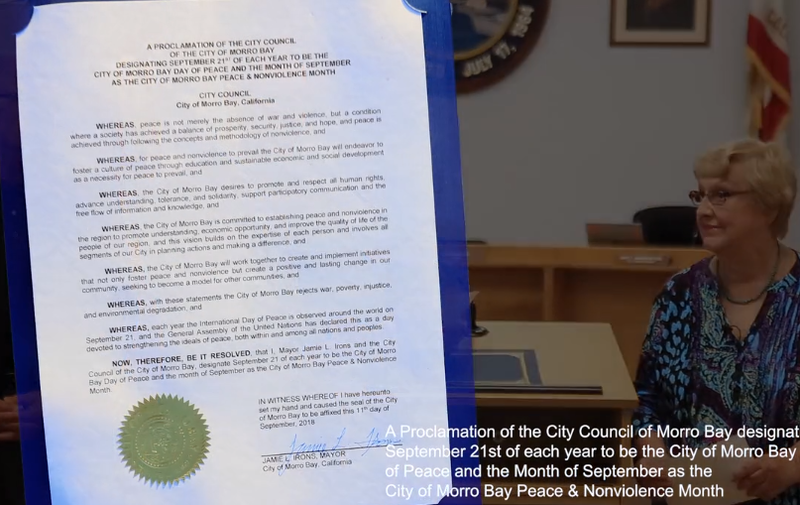 Morro Bay, California - the mayor and city council issued the peace proclamation for the city. Watch the video. Read the proclamation.